Here's a charming white satin handpainted Fenton mouse figurine (made by Mosser Glass) and offered as a Fenton Gift Shop Exclusive. Only 20 were decorated in this design. This adorable mouse was designed and handpainted by Kim Barley. 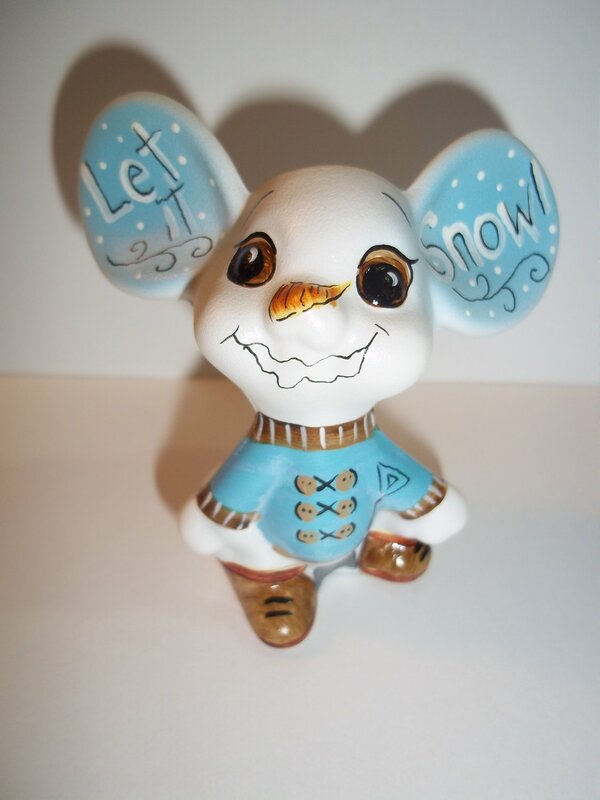 It is handpainted with a whimsical "Let It Snow" pattern with the mouse dressed in winter attire with a snow shovel and a snowman face with carrot nose. There is a snowman on the back as well and "Let It Snow" sentiment in it's ears. It is signed, dated and numbered #15/20 by Kim Barley. It measures approximately 3" tall and is in brand new condition. CHERUB CATS ANGEL KITTY TAPESTRY AFGHAN BLANKET THROW 54" x 70" USA MADE!